Site code ACC given by Corpus of Maya Hieroglyphic Inscriptions (1999:187-189; 2012; 2016); alternative site code ACA from Riese (2004). Location verified with and coordinates retrieved from Google Maps Web Services (accessed July 23, 2015). 1997 Extraordinary Stucco Mask Discovered at Acanceh, Yucatan. Mexicon 19(6): 104–105. 1908 Archaeology in Mexico. Man 8: 34–37. 1947 Descubrimiento y exploracion arqueologica de la subestructura del Castillo en Chichen-Itza. Proceedings of the International Congress of Americanists 27(2): 229–248. 1939 Exploraciones en Acanceh. Proceedings of the International Congress of Americanists 27(2): 249–253. 1914 The Maya Zodiac at Acanceh. American Anthropologist 16(1): 88–95. 1991 The Frieze of the Palace of the Stuccoes, Acanceh, Yucatan, Mexico. Studies in Pre-Columbian Art and Archaeology 3. Washington, DC: Dumbarton Oaks. 2014 Cronologia y asentamiento del sitio de Acanceh, Yucatan. In: The Archaeology of Yucatan: New Directions and Data. Vol. , edited by: Travis W. Stanton, pp. 93-. Archaeopress, Oxford. 1988 North of Yucatan. INAH-Salvat, México, D.F. 1911 Die Stuckfassade von Acanceh in Yucatan. Sitzungsberichte der Königlich Preußischen Akademie der Wissenschaften 47: 1011–1025. 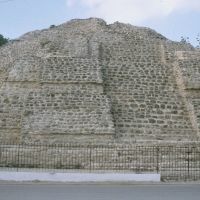 2008 Beyond Economic Imperialism: The Teotihuacan Factor in Northern Yucatan. Journal of the Anthropological Research 64(3): 395–409. 1985 Two Maya Monuments in Yucatan: The Palace of the Stuccoes at Acanceh and the Temple of the Owls at Chichén Itzá. Publications of the Frederick Webb Hodge Anniversary Publication Fund 12. Southwest Museum, Los Angeles, CA.